Through the generous grant from the Elizabeth George Foundation, I was able to travel to Guatemala to research a novel in progress. The trip also allows for a huge amount of writing time. 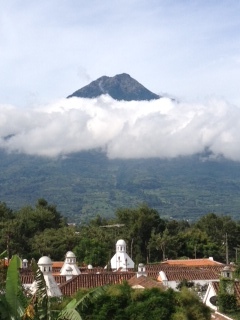 Here’s a view of a volcano outside of Antigua, Guatemala, taken from the roof of my hotel.